I find catching serial killers (on paper of course), well... fun. Do you really need to know anything more about me? 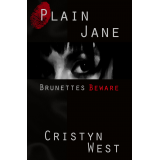 "Wickedly macabre and blisteringly paced, PLAIN JANE marks the debut of a thriller for the new millennium. Brash, funny, terrifying, and shocking, here is a story best enjoyed with all the lights on. Don't say I didn't warn you!"